It’s not Friday anymore…my Friday this week was super-busy and my internet was too sloooow for a quick post, but I wanted to share this old poem. A few days ago, because of a series of coincidences, I spent maybe twenty minutes catching up with a man I hadn’t seen for almost forty years – back when he, his wife Sandra and my husband Bryan were very young teachers in Terang, Victoria. I wrote this when Sandra and Iain’s first child, a daughter, was born. I didn’t think to ask him if he’s a Grandpa! Brought to bed of a daughter. To bring forth a child again. 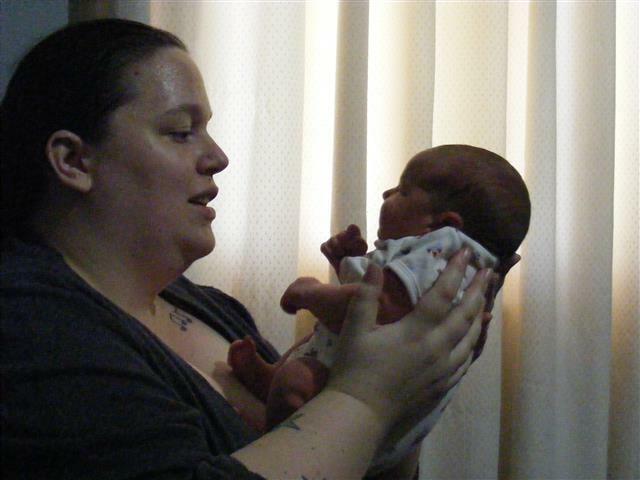 I don’t have any photos of Sandra from back then (or later), so here is my daughter and her daughter, a few days after juniper was born last year. The Fonz does date back to the 70’s in Terang, though (actually, that’s Simon, aged about 15 months). We were young folks, and we made our own social lives in a small country town. One of our themed parties was a “Fifties” night, party inspired by a current TV show called “Happy Days”- maybe you’ve heard of it! While I was working on/prevaricating over this post, I came across this series of mixed media pieces I made a few years ago, called “Pattern Making”. It was inspired in part by an extract from a Victorian book which advised that little girls should be encouraged to play with dolls in order to learn to look after babies, do the laundry and generally make themselves useful. Which annoyed me. I have five children, and I absolutely understand the human drive to ‘bring forth’ children, however, I am not at all taken with the idea that girls should be given dolls in order to be made “gentle and useful”, nor with the notion that doing laundry will give her “the most intense delight”, as if that were the be-all and end-all of life for a female. 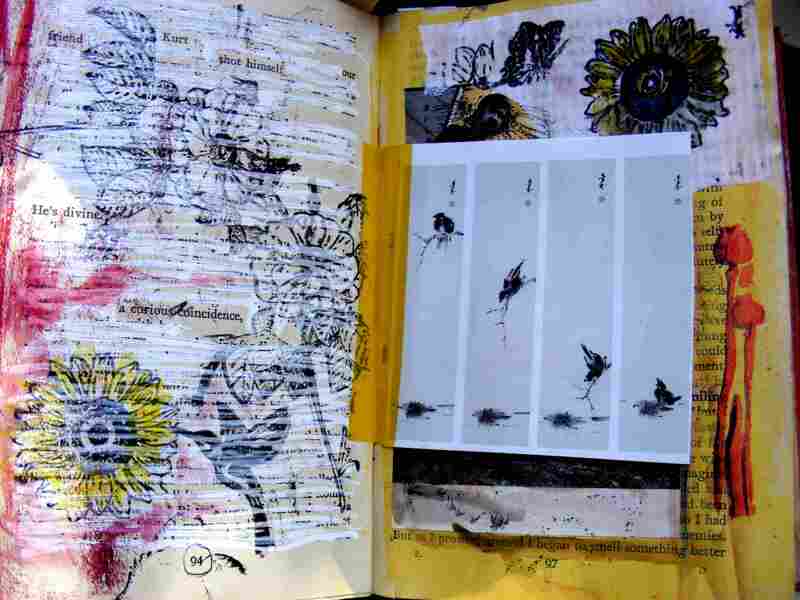 A curious coincidence – When I painted over the text on this page of my altered book, “Escape”, I left a few words uncovered, then decorated around them with flower stamps, plus a hummingbird. The artwork of the added page is by Melbourne artist Kim Hoa Tram – I saw an exhibition of his work at the National Gallery of Victoria, including this work, “Awakening”, which depicts a live sparrow grieving over a dead one. It seemed a good complement to the redacted text on the opposite page, and it’s beautiful. With a concert DVD and a few watercolours and/or a pen, one can explore doing ‘life’ drawings, such as the one here. It’s possible to cheat a bit, and pause the DVD, or work really quickly form a fleeting image. I’m not sure where the piece of paper came from – I liked the words, and added the girl’s face. I have never physically made a bonfire on a beach , but it’s a favourite mental exercise of mine to imagine a beach and a big bonfire of drift wood, onto which I toss whatever it is I need to remove from my life. 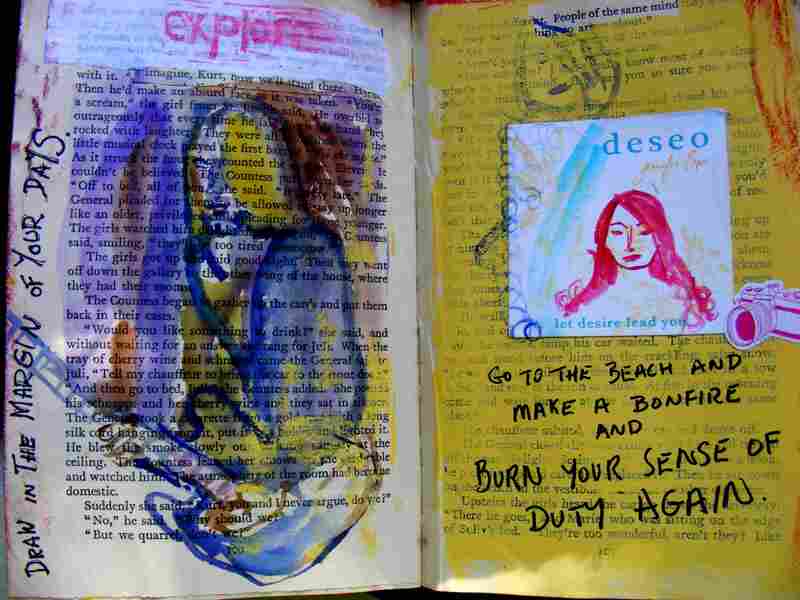 A Sense of Duty is a regular for this – it gets in the way of art, far too often. It’s good to “draw in the margin of your days”, but it’s possibly even better to draw in the middle of them as well! 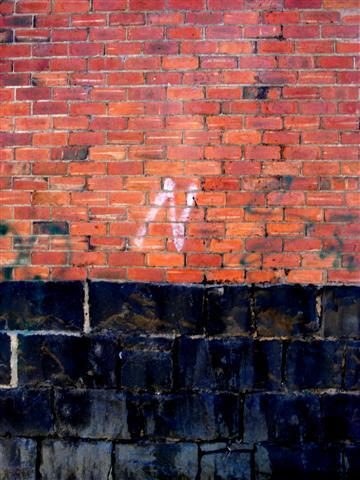 The challenge this week is ‘angular’, and as usual, the theme is open to interpretation. One could choose an unusual POV for an odd angle on a subject, find multiple angles in architecture, or simply a street corner. A couple of weeks ago, I walked along this lane in Ararat – it’s behind the shops and hotels of the main street, and in thirty years, I’d never found occasion to go there, although I crossed it many times to visit my friend in Banksia Street. The back-ends of perfectly respectable and ordinary businesses show a quite different angle of the town…I particularly liked the little old toilet building – not sure what it’s behind. I went there on a Sunday afternoon to check out a new enterprise called “Back to Cool” which has opened, selling old wares and collectibles in the lane, and I was so taken with the novel views that I pulled out my camera. You can see in the second photo , that the lane running down from Barkley st, past the Court House Hotel, is itself on a steep angle! A good fitness challenge to hurry up there! I had a bit of fun with this poem (a lot of fun, actually). I once heard someone on the radio say that “Just because it didn’t happen, doesn’t mean it isn’t true”, which I found quite profound. I’m fairly sure it was on The Coodabeen Champions, a lighthearted and lightweight show about AFL “footy”, not known for being deep and meaningful. However, that jokey insight helped form this poem. 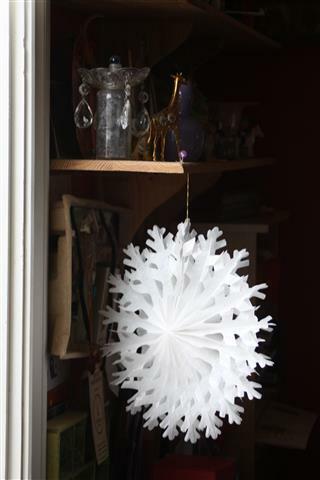 I’ve picked out some recent photos that include symbols, or objects that are symbolic representations of something real… I bought this symbolic snowflake last year at the Bodhi Tree Bookstore Cafe in North Perth, during my three month stay there after my grand daughter was born. I enjoyed a lot of coffee, and chai, and the occasional Portuguese custard tart. And some books. So all of that is symbolised for me by this pretty white tissue paper frippery! 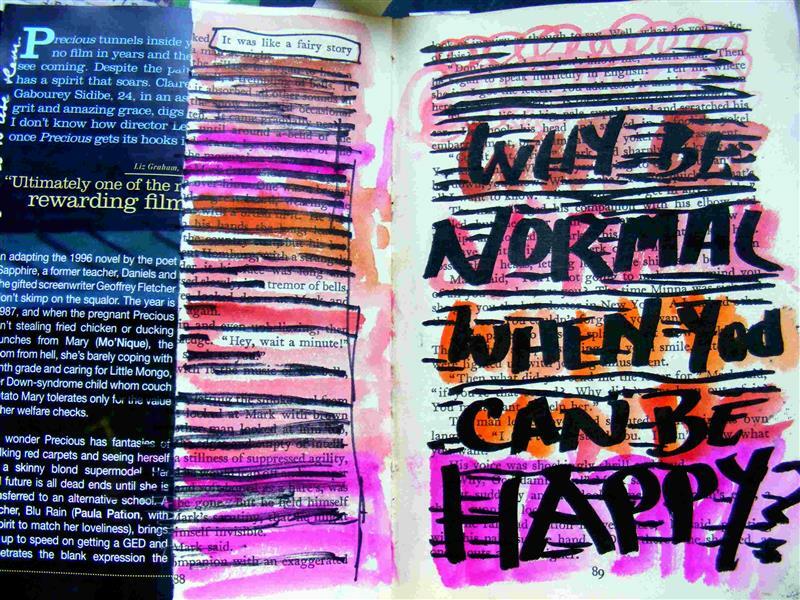 This page from my altered book “Escape” was first printed with a hand-carved stamp, which didn’t come up very well – so…I painted over parts of it with bright pink and orange Peerless watercolours, for a start. 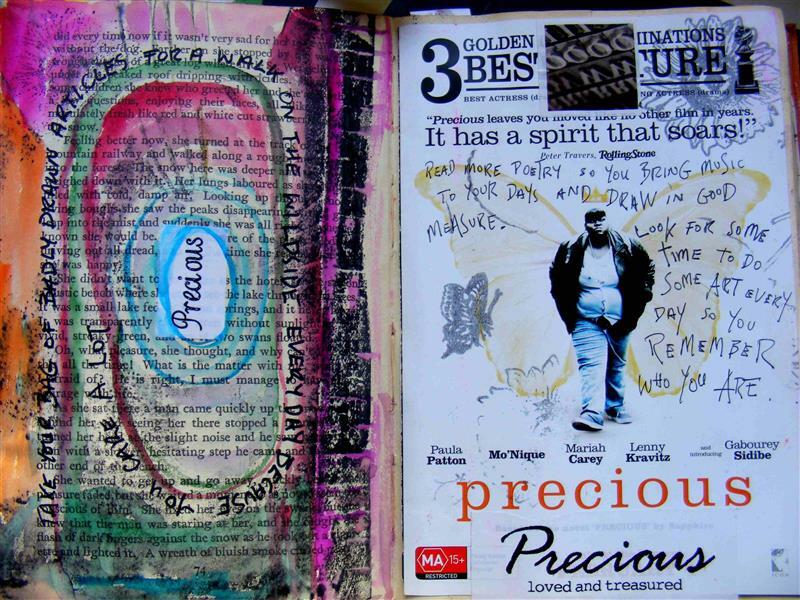 A piece of text – incorporating some song lyrics to produce life advice – curls around the centre of the page, where I stuck the word ‘precious’, from a sheet of scrapbooking stickers. Another from the same sheet appears on the facing page, which is an advertising flyer for the wonderful film of that name. ( I think it may have been released under a different name in the States). I also added flowers and a butterfly, and more advice for making your spirit soar. I had glued the flyer to a half-page, leaving some of the original text visible. You can’t see it in this photo, but I wrote “Sabine women carry swords and know how to use them” along the outer edge. I redacted a few words of the book page, and painted it with more of the Peerless colours. The text on the opposite page is a play on the title of Jeannette Winterson’s memoir – something her unhappy, well-behaved mother said to her. 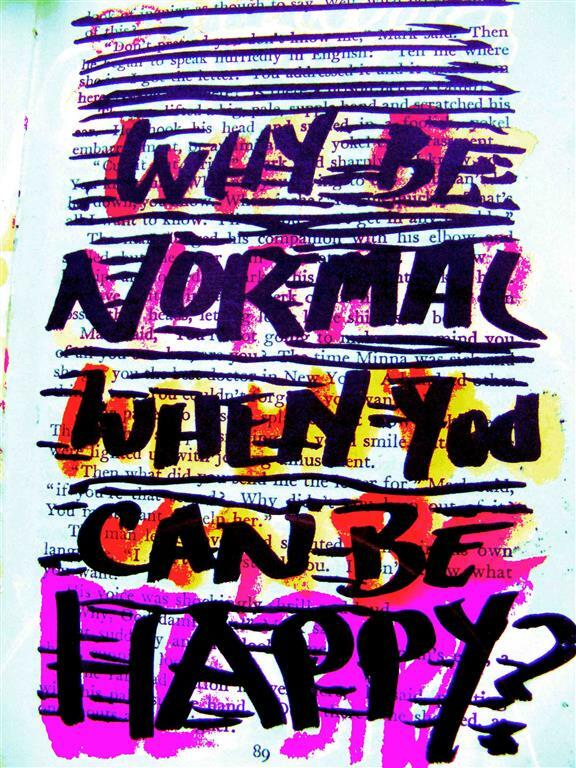 I much prefer my version! 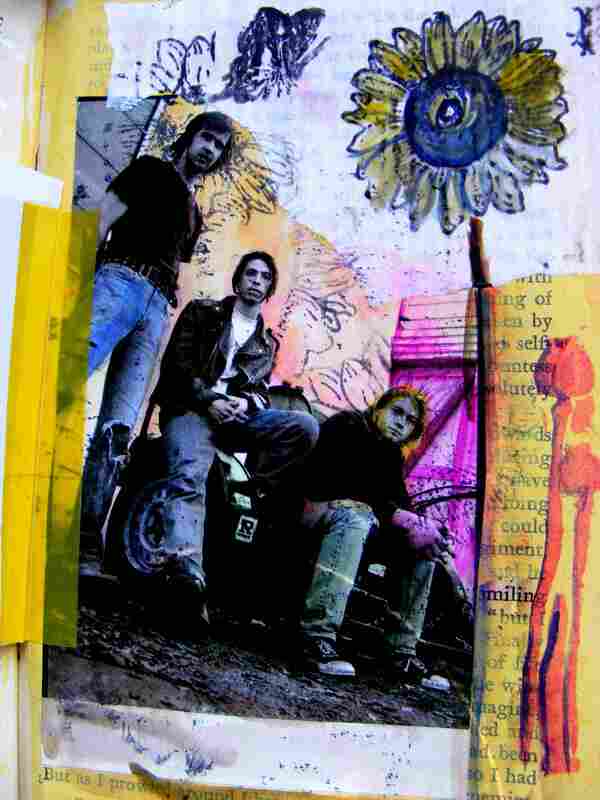 I wrote the text first – with a big fat Sharpie – and then crossed out the original text, working around the letters. Colour was added later. Very simple for a simple message! 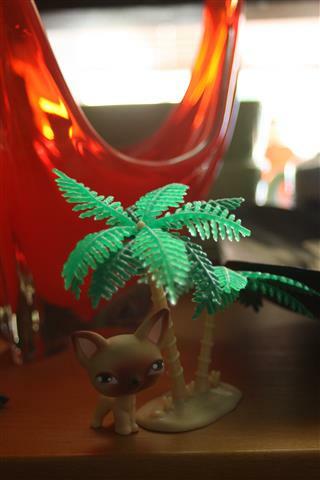 Another tricky theme this week for the Weekly Photography Challenge – Achievement! I certainly haven’t run any marathons, but I do have five (grown) children, which is probably tougher. It certainly takes longer – I’m not sure where the finish line would be…I didn’t choose motherhood for my photos this week, though. 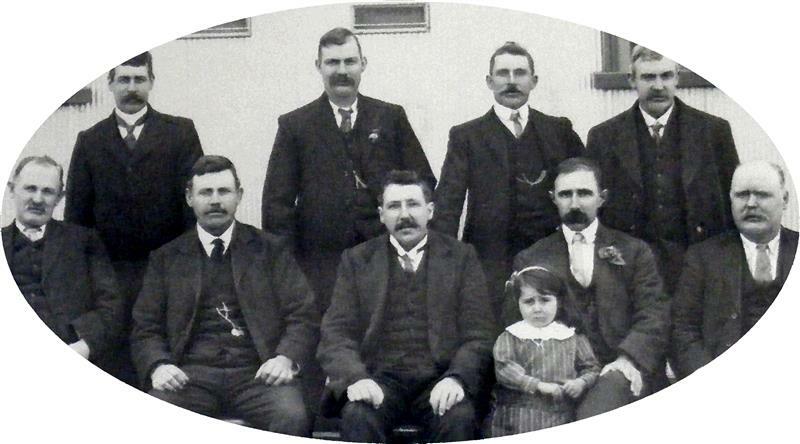 This is the 1914 committee, and it wasn’t even Movember! Our Hall has a proper raked stage and proscenium arch, even though it is quite tiny, and the acoustics and dance floor are excellent – some achievements of the original builders. The original bench seats are still there. Some of them are not the best, but it seems wrong to part with them after all this time. Thousands of cups of tea and coffee have been served from the kitchen (not the original, which was a dark affair with a copper in the corner – less than thirty years ago). The new kitchen is another achievement of our community! One wall is adorned with portraits of early settlers, some of them wrongly named over the years. They were researched as much as possible in the lead-up to the Centenary, and that information, along with a history of the Hall and some photos we managed to track down of events over the years, went into a book which was printed with the help of a grant and sold to everyone interested. The weekend of the Centenary saw the Hall packed for the book launch (and afternoon tea – I think we made another hundred or so cuppas). All the memorabilia we had gathered was on display all weekend, and on the Saturday night, we had a Ball. A popular local duo – Parso and Dave – provided the music, everyone dressed up and had a really good time. I think the last few guests left around 2 am, with us old people waiting to lock up and go home to bed. The whole weekend was a major achievement for a small rural community! I don’t have any photos of the surprise visit from Jack and Jill Kinder, so I picked three that seem to fit. 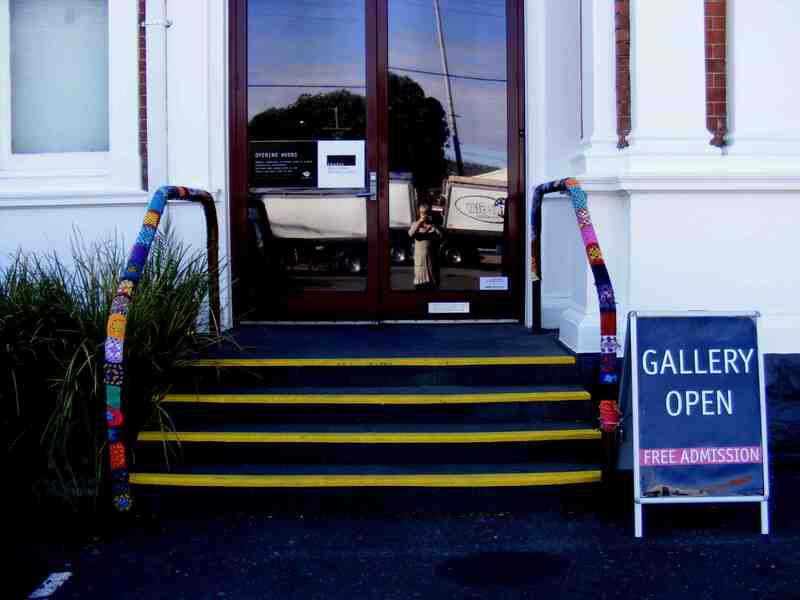 The one of the Gallery entrance, I took after completing a yarnbomb to celebrate the Gallery’s fortieth birthday. You can see me reflected in the glass of the door. That’s the door the Kinder kids came through (with 12 adults, I should add!). The paper flowers are on the office desk in the gallery. 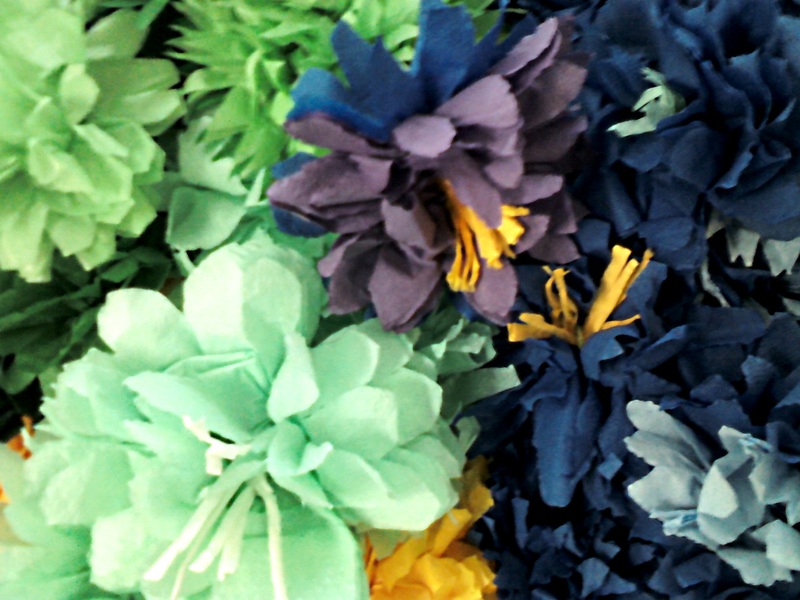 We were making them for Children’s Week – school children made hundreds for an installation in the Ararat Library. 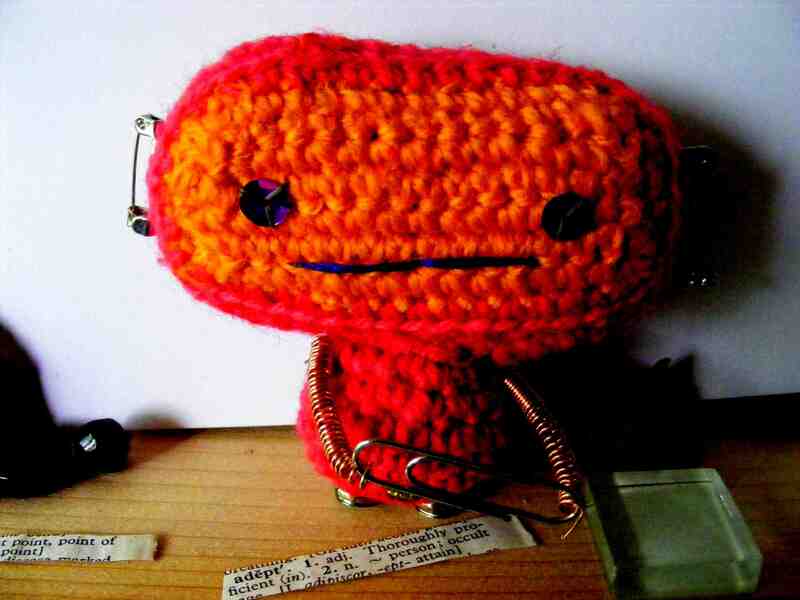 The arigurumi crobot (that’s ‘crocheted robot) is just a curious and colourful little character. The children looked at (but didn’t touch!) an exhibition of quilts by local and regional artists ,”Integrate/Separate”, “Organic Intimacy”, featuring works from “ten women artists working with a range of textile related processes”, and a small selection of works from the Gallery’s permanent collection. Hopefully some of those youngsters might have acquired a taste for art and art galleries, and come and visit us again!